"Paul LePage = Bad for Maine. 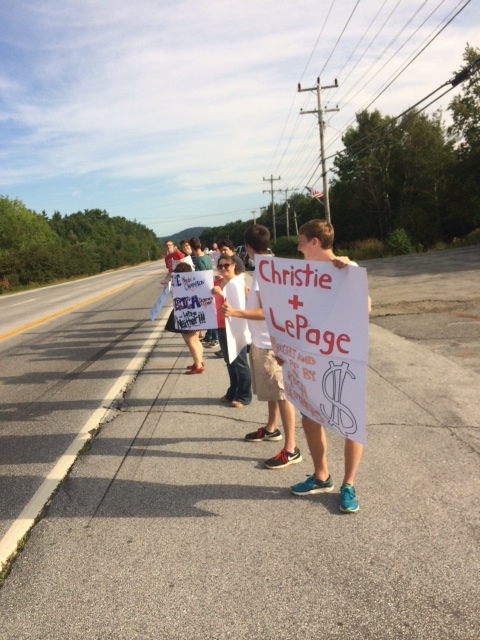 Chris Christie = Bad for America" and "LePage and Christie - a bridge to dirty Koch oil money" are just a few of the messages greeting New Jersey Governor Chris Christie at a fundraiser in support of Governor Paul LePage this afternoon in Dedham. Protesters plan to picket the fundraiser to call attention to the governors' connections with conservative big money donors Charles and David Koch. The event comes on the heels of a $500,000 television ad campaign launch in support of Governor LePage - funds supported in part from the $1.77 million contributed to the Republican Governors Association (RGA) by the Koch brothers this election cycle. "Whether it's dismissing the public health effects of chemicals like BPA on pregnant mothers, rubber stamping lobbyists' agendas into his policies, or his work behind the scenes to scuttle a major wind energy project, it's clear that Governor LePage only has the interests of big corporations and donors at heart," said Jesse Graham, Executive Director of the Maine People's Alliance. "Governor Christie and the RGA's visit to Maine is just a reminder that out-of-state interests will spend anything to protect their investment in the Blaine House." Governor LePage's corporate coziness stretches back to his first days in office. Documents and emails obtained through Maine Freedom of Access requests in 2011 revealed that the LePage administration had engaged in the practice of copying and pasting lobbyists' agendas directly into policies (Portland Phoenix: "The LePage Files"). In May, the LePage administration came under fire when the Maine DEP announced it was dropping a proposed rule regulating the chemical formaldehyde in children's products after receiving pressure from major formaldehyde manufacturers, which include the Koch-owned Georgia Pacific Company (BDN:"Maine agency drops plan requiring disclosure of formaldehyde in children's products"). As head of the RGA, Governor Christie has maintained a close relationship with the Koch brothers. Labeled by Charles Koch as "my kind of guy," Governor Christie has been a keynote speaker at the Koch's ultra-exclusive seminar and has held several private meetings with David Koch (Mother Jones: "Chris Christie Lets Loose at Secret Koch Brothers Confab"). At the Conservative Political Action Conference in March, Christie lauded the brothers for their contributions to the conservative movement. Both governors have been the source of on-going controversies. Governor Christie continues to fend off allegations of involvement in the "Bridge-gate" scandal, where aides ordered the closure of lanes on the George Washington Bridge as a form of political retribution, even as the U.S. Attorney for New Jersey continues to build a case against Christie's staff. In Maine, Governor Paul LePage continues to court controversy with the recent revelation that he met with an extreme, right-wing fringe group eight times and discussed topics such as whether Democratic leaders should be hanged for treason. Governor LePage has also come under fire for his failure to recoup taxpayer money spent on no-bid contract for a heavily plagiarized report on Maine's public assistance system. "Governor Christie is doubling-down on Paul LePage, one of the most extreme governors in the country, who was just revealed to have met eight times with conspiracy theorists to discuss executing his political opponents for treason," said Graham. "It's clear that Governor LePage and his friends at the RGA are more interested in their own extreme and out-of-touch ideology than they are in representing the views of everyday Maine people."